Twitter filed to go public yesterday, choosing the stock ticker TWTR. Twitter shares are expected to start trading before Thanksgiving this year. But it looks like some investors are a bit confused. A company called TWTR Inc., which as far as we can tell has nothing to do with Twitter, is up a whopping 1,500% today, but fluctuating wildly. If you're a Windows user but still covet Apple's ultra-sharp "Retina display" screens, Dell has introduced a new laptop with a display that beats those on Apple's MacBooks. 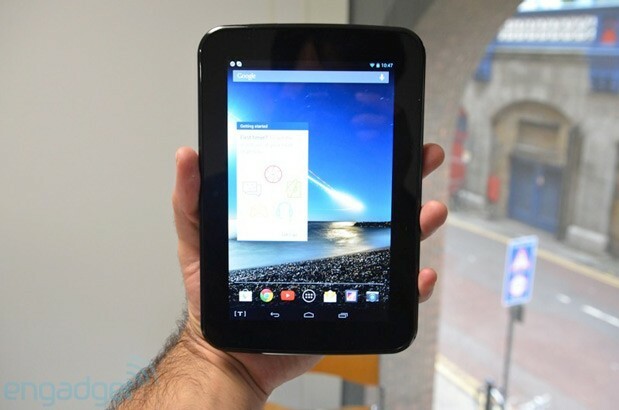 Wondering how your old buddy Tesco is faring with the launch of its first branded bit of hardware, the £119 Hudl tablet? Well, according to Tesco's CEO Phil Clarke, via a tweet from Retail Week's Jennifer Creevy, not too shabby: the supermarket chain has offloaded about 35,000 of the devices over the past few days. We very much doubt the likes of Google and Amazon, which have never been forthcoming with early sales figures, will be threatened by the number, but it's surely not a bad start from a retailer that knows more about selling bread and milk than tablets. Incidentally, Amazon's just dropped the price of its soon to be last-gen 7-inch Fire HD to £119, matching that of the Hudl -- if you've got no ClubCard points to secure a discount, that is. We now have one of Tesco's tabs in our possession, so look out for the review. We're assessing the display by rewatching the entirety of Game of Thrones, however, so it might take a while. Samsung's Galaxy Note series has been the most popular BIG phone since it was first released a couple of years ago. 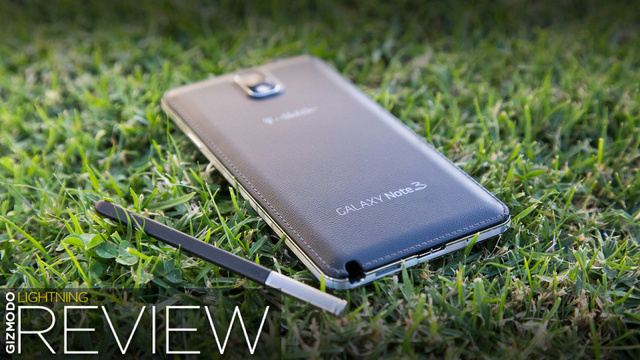 The Galaxy Note 2 made some major improvements over the original in terms of speed and utility, and while the Galaxy Mega was a giant step backwards, the Galaxy Note 3 looks to leapfrog them both. And, generally, it does. FreedomPop, promiser of free data, is finally launching the first actually free service plan into beta today. It comes with free texts, free minutes, and free data. All you have to do is front $100 for a phone. It was just two weeks ago that HP spat out a bunch of new consumer laptops ahead of the holiday shopping season. Now that those products are official, HP is shifting its attention to business customers: the company just unveiled five corporate-friendly notebooks, two of which qualify as Ultrabooks. Starting with the outfit's higher-end EliteBook line, we've got three models: the 12-inch 820, the 14-inch 840 and the 15-inch 850. Like previous generations of EliteBooks, they meet the military's MIL-SPEC-810G standards for ruggedness, but this time, they're 40 percent thinner and 28 percent lighter. Across the board, you're looking at magnesium lids, which have been painted with four coats of paint to minimize scratches; the keyboard deck, meanwhile, is made of aluminum. Speaking of the keyboard area, all three models sport backlit keys, with a special finish applied to the buttons to help keep them fresh over the three-year warranty period. Interestingly, battery life is the same on all units (up to 12 hours), though the 14-incher, specifically, can be paired with an optional slice battery for a total of 33 hours of juice. On the inside, all of them run Haswell processors, as you'd imagine, though only the 840 and 850 meet Intel's Ultrabook specification. Once it comes time for your IT guy to configure this, he can get any of the three machines with an optional touchscreen, along with an LTE radio and either an SSD, HDD or hybrid hard drive. As for IT support, these are vPro CPUs, as you'd expect, and there's also TPM on board for added security. Additionally, as on previous models, the entire back shell is removable with a single latch, making it easy to swap out components. 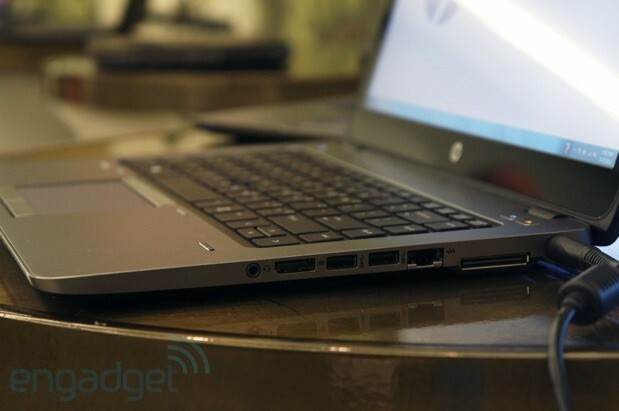 Finally, HP included an all-important Ethernet jack, complete with a drop-down jaw, along with a SmartCard reader, docking connector and legacy VGA port. All are available today with pricing as follows: the 12-inch 820 starts at $859, the 840 goes from $799 ($949 with a touchscreen), and the 850 costs $939. Toshiba's overall TV division may be ailing, but it's innovations like this that'll keep it from completely decaying. 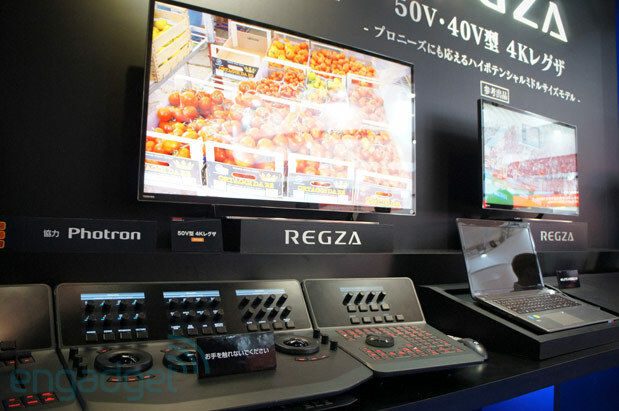 Displayed at the company's CEATEC booth here in Japan are two new 4K HDTV displays -- the 40-inch 40V and 50-inch 50V. Outside of devilishly-thin bezels and native 4K resolutions, the company's not talking specifications. 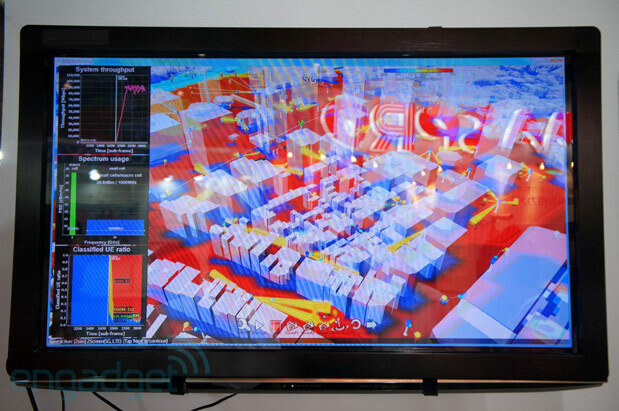 What it's focusing on instead is the concept: it's dreaming of an Ultra HD range of displays that can operate as televisions and as pro-grade reference monitors. After all, budding editors who are being tasked with cutting together 4K footage certainly deserve a monitor that won't cut corners, right? A company representative informed us that while the displays weren't perfectly color accurate, they were far superior to rivals. Plus, the ability to easily toggle between reference mode and various other living room-accepted modes will enable a level of A/B testing that's pretty tough to get right now. Naturally, both monitors looked stunning up close, and if we're being candid, we're fallen in love with Photoshop all over again after seeing it displayed on these guys. Today, BitTorrent announced it's building a private instant messaging client for our post-PRISM world. The firm told CNET that BitTorrent Chat should function like the company's other peer-to-peer services, using a form of torrenting's decentralized technology-approach that's been adapted for real-time communications. And while compatibility with other IM protocols is expected in the future, for now it's exclusive to BitTorrent account holders. You can even apply for an invite into the pre-alpha at the BitTorrent Labs site -- if you're so inclined, that is. Samsung chose to name part of its enterprise smartphone security suite after an Army post, but LG's going for something entirely more generic: Gate. The company's solution appears to work much like JK Shin and Co.'s, safeguarding both private and business data as they coexist on a phone, allowing outfits to use a BYOD (Bring Your Own Device) setup. By wielding Gate, users can encrypt their hardware's data, use a VPN and make the lives of IT departments easier thanks to mobile device management features. It's not clear the software will be offered gratis, but it sounds like it'll be available just in time for the G2's trip stateside. We knew good and well that Japanese carrier NTT DoCoMo would be divulging details about its 5G wireless plans at CEATEC, but the claims that we've stumbled upon here in Chiba are nothing short of bananas. Granted, the operator is making clear that its vision isn't intended to reach implementation until 2020, and it confesses that a 5G standard has yet to be ratified. That said, it's dreaming of a world where its network offers "1000 times the capacity and 100 times the speed as the current network." Representatives for the company told us that the challenge is going to be dealing with range limitations in higher frequency spectrum, but it plans to employ "high-frequency bandwidth by transmitting with a large number of antenna elements." 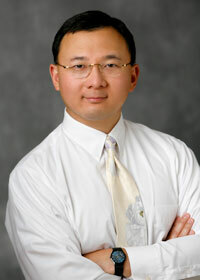 The goal for looking so far forward? It's already seeing an insane appetite for video on networks that can barely maintain poise under the load, and the notion of transferring 4K content to the masses is going to require a substantial upgrade. CEATEC's known as a place that allows companies to dream big and aim for the fences, but we'll be honest -- we'd really, really prefer that 2020 arrived sooner rather than later. You can't say that the Google Drive crew isn't looking out for you. Following the transition of QuickOffice for Android and iOS into a freebie, the team is now blessing Google Docs with a slightly more attractive interface. First and foremost, you'll now find a familiar, colorful product icon in the upper left part of the web app, which links back to Drive. This refinement applies to Docs, Sheets, Slides, Drawings, Forms and Apps Script, and it could very well help users of another office suite feel more at home. 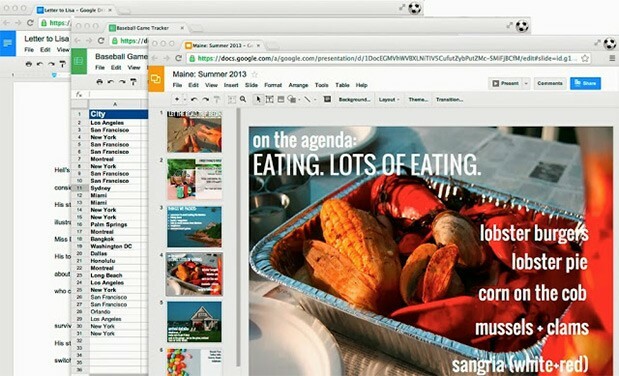 Additionally, the headers within each of the editors are now more compressed, which Google hopes will allow users to focus more easily on their content. Naturally, these aren't the most dramatic visual changes, but then again, do you really want a card-based UI for your document editor? 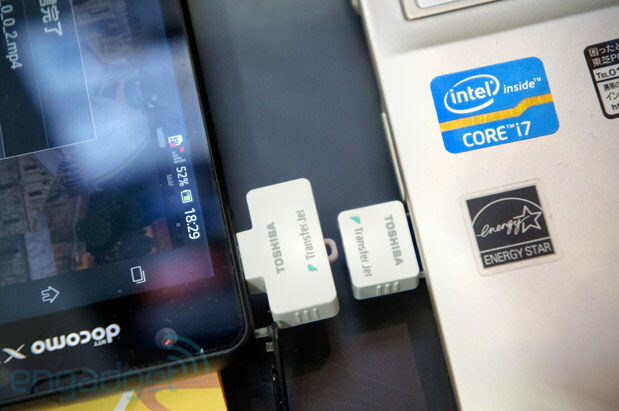 Toshiba's TransferJet has kept relatively quiet since we got the full explanation (spoilers: high-speed data transfer over very short distances) on stage at CES 2013. Finally, several Toshiba products are now ready for launch. Alongside a compatible SDHC card, there's also has a new micro-USB adapter that plugs into your (Android-only, although Toshiba are in discussions with Apple) smartphone, enabling those much-faster-than-Bluetooth data speeds over a distance of a few centimeters. 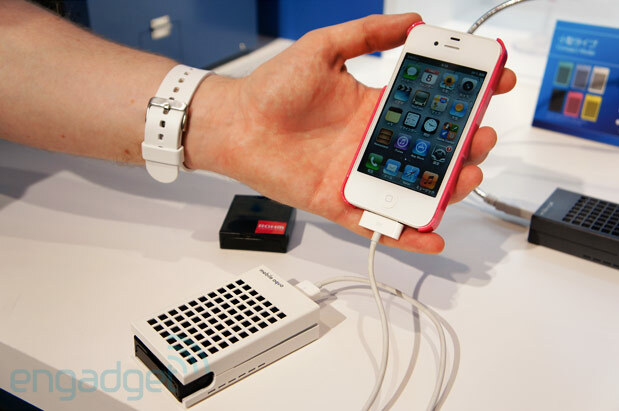 It worked without a hitch on the show floor here at CEATEC, and the TransferJet duo is set to go on sale this December. Toshiba's spokesperson added that pricing for the pair of adapters will come in at around 10,000 yen (around $100), although it was the tiny chip sat next to it that really piqued our interest. Toshiba is planning to get its TransferJet tech embedded within smartphones and other products in the future, which could make a far more convincing argument for the file transfer technique. One module chip has been given a December production date, although the company wouldn't spill the beans on exactly which devices we'll see it in. 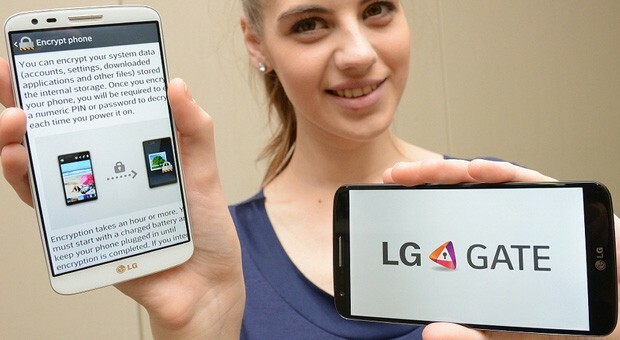 Somewhere out there, someone is probably waiting for a more affordable LG Optimus G Pro, and if the LG G Pro Lite Dual turns out to be real, then their wish might soon be granted. The phone will reportedly boast dual-SIM support and retain the size of its predecessor's 5.5-inch display, but it'll have a 960 x 540 pixel resolution instead of full HD. 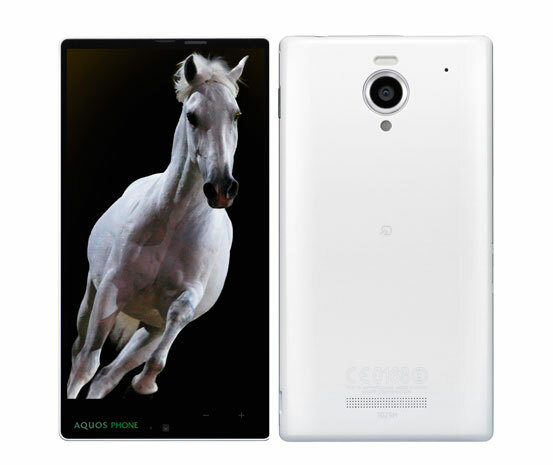 It'll understandably be equipped with other lesser specs, including an unspecified 1GHz dual-core processor, 1GB of RAM, a 3,140mAh battery, an 8-megapixel rear camera and 8GB of internal storage that's supplemented with a microSD card slot. According to the Russian website that first reported the leak, the Android 4.1.2 phone will be available in the Eurasian country in October for $400 unlocked, which just happens to be cheaper than the Galaxy Mega. 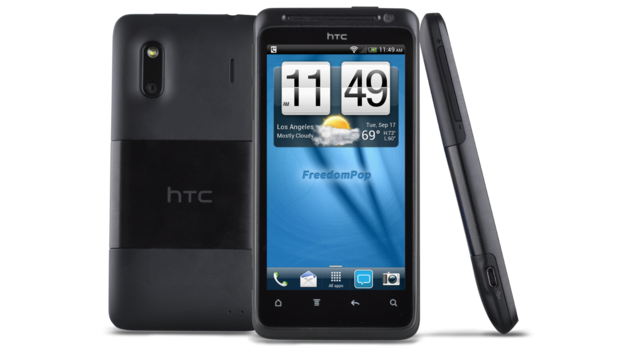 Obviously, you'll have to shell out for the more expensive Optimus G Pro if you want better specs, but at least this one comes with a stylus. Unless Congress can miraculously agree on a budget between now and midnight, we'll see the U.S. government shut down starting tomorrow. However, this is no reason to dump all of your stocks. 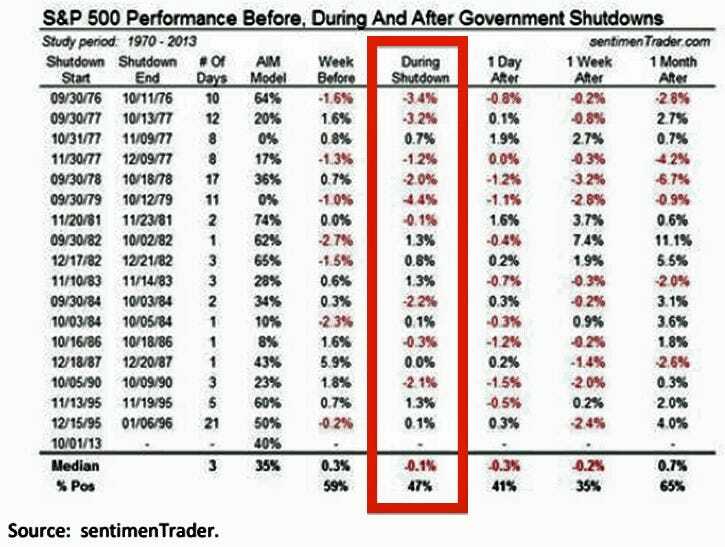 Raymond James strategist Jeff Saut included this handy table from SentimenTrader of S&P 500 performance during the last 17 government shutdowns. The median return during a shutdown: -0.1%. And returns are positive 47% of the time. Remember, history is only a guide, never gospel. As if shelling out $900 this holiday to snag the two next-gen game consoles wasn't enough, Xi3's Piston modular gaming PC is arriving on November 29th for $1,000. Should money be no object to you, the adorable little box is available for pre-order right this minute, and that'll lock in an earlier arrival by two weeks. Included in today's news of the Piston's launch date is word that internal storage capacity was upped by another SSD connector; Xi3 says up to 1TB of SSD storage is now supported. In a hilarious nod to Valve's Steam Machines news last week, Xi3 notes, "By adding a second SSD to their Pistons, users will be able to load a second operating system onto their machines, including the newly announced SteamOS." As previously reported, Xi3 is (at least in part) financially-backed by Valve, and the Piston is a bit of a "Steambox" (the previous name for Valve's Steam Machines effort) itself. SteamOS is said to be coming "soon," ahead of Steam Machines' official launch in 2014, and you'll see no surprise on our faces should SteamOS arrive ahead of Piston's November 15th pre-order availability. 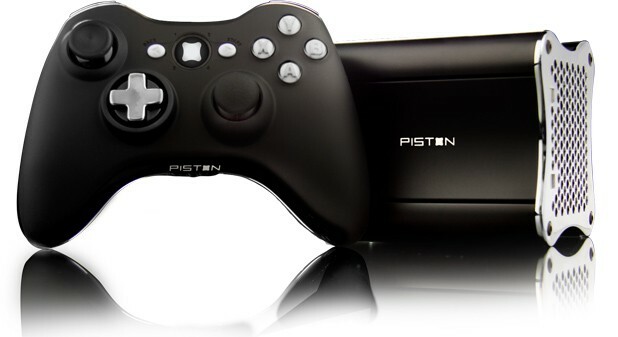 On Xi3's homepage, the Piston is positioned with a wireless, Piston-branded gamepad (seen above). It's unclear if it ships with the system later this year, so we've reached out to Xi3 for more info. 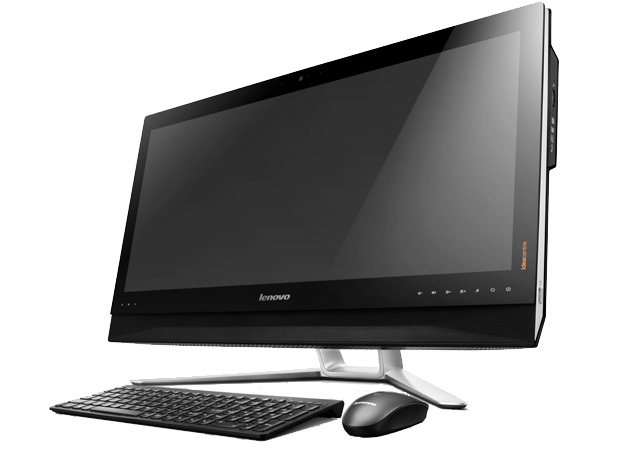 Lenovo is known for all-in-one PCs that stand out, and that's certainly true of a new four-model update to the company's IdeaCentre line. The headlining B750 is reportedly the first PC to include a 29-inch, 21:9 aspect ratio display; its 2,560 x 1,080 panel is potentially ideal for both movie aficionados and multitaskers. Lenovo appropriately equips the B750 with a 2.1-channel JBL audio system, and gamers may like the combination of Haswell-based processors with standard GeForce GTX 760A graphics. The system ships in October with a $1,199 base price. 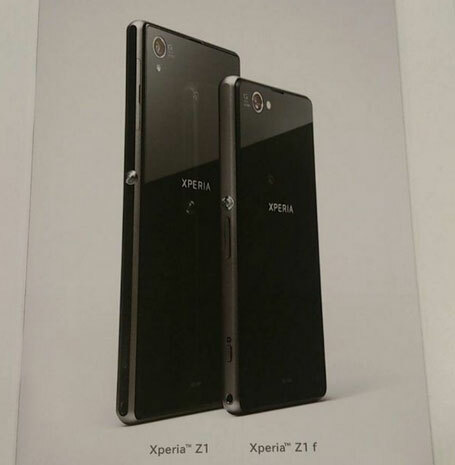 Now this is what we'd call bucking the trend: a leaked document obtained by Xperia Blog, allegedly pertaining to Japanese operator NTT DoCoMo, outs a new Sony device that looks to be a mini Xperia Z1. That Sony would be quick to jump on the mobile industry's popular 'mini' craze is unsurprising, but what does seem peculiar is how the company's approaching the specifications of this 4.3-inch Xperia Z1 f. Instead of just retaining the name and shrinking the Triluminos display down (here, it's 720p) while lessening the spec load, it appears Sony's porting over both the 2.2GHz Snapdragon 800 processor and the 20.7-megapixel camera of the Z1. If true, that would explain the Z1 f's increased thickness, making this Honami mini a near-equal to its flagship namesake. Its more pocketable screen size could also help attract customers (especially those with smaller hands) that would otherwise shun a 5-inch device. What's more, the Z1 f looks to be taking a page out of the industry's prized color book (see: Apple, Nokia) and could be available in bright pink and neon yellow, in addition to the traditional black and white. Of course, colorful phones are nothing out of the ordinary for Sony's home market and it's possible this variant could be Japan-only. Only time will tell if the Z1 f is more than a clever work of digital smoke and mirrors, but based on what we're seeing, we sure hope it isn't. Big video game makers, like their cousins in books and music, have scrambled in recent years to adapt to the digital technologies buffeting their business. Tens of millions of people now play games on smartphones and tablets, usually for a sliver of the cost of playing on a game console. Phil Zimmermann, the creator of the email encryption software PGP, has warned that anyone who uses consumer email services needs to be aware of the threats of exposing their metadata to eavesdroppers. Kicking off this week's CEATEC show in Japan, Sharp has played to its strengths with its new Windows 8 tablet, the Mebius Pad, factoring in a 2,560 x 1,600 resolution display. That puts it pretty far ahead of the current crowd of 1080p Windows 8 tablets, including Microsoft's incoming Surface 2, although we admit, we'd have loved to have seen another incredible 4K tablet. 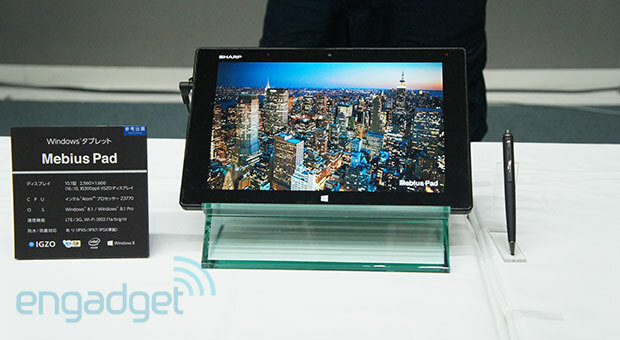 Regardless, that's the highest resolution Windows 8 tablet we've seen yet. Alongside the company's 10.1-inch IGZO panel (known for their low-power credentials), the Mebius Pad runs on a slightly less-exciting Intel quad-core Atom processor (the Z3370), which we've had mixed feelings on when it comes to the Windows tablets its powered in the past. The basic Windows 8.1 model will arrive with Office for free, although you'll have to pay extra if you want it for the Pro edition. Also, following Japanese trends for practically any device, the slab is both water and dust-proof (it's in the midst of being certified for IPX5, IPX7, IP5X), while you'll be able to buy it with LTE radios on board, at least for Nippon, as the device is unlikely to leave Japanese shores once it launches in early 2014. Usually startups take a little break between raising their seed rounds and their Series A, but not Swiftype. This "search-as-a-service" company has closed $7.5 million, just 6 weeks after announcing a $1.7 million seed round. The 1964 Ears V6-Stage is a tour de force of in-ear headphone design, and they're hand-crafted in Portland, Ore. If the NSA only invited TechCrunch to its birthday party, it'd have to eat its cake alone. While we aren't big fans of the NSA, it appears to fancy our readers, as it consistently advertises on our site. Just a quick heads up to a fantastic Chrome extension I've been using of late: The Great Suspender. I'm sure there are others out there, but this is the one that has worked for me and it has dramatically improved my Chrome and overall computer experience.